Frostgrave is fantasy skirmish miniatures game by Joseph A. McCullough. You command a wizard, his apprentice and some brave soldiers against other warbands trying to loot the treasures in the frozen city of Felstad. At the start of each campaign, you have to choose the school of magic of your wizard and 8 spell cards. Each spell card can be used multiple times in a battle, and they have a cast number that you have to roll for the spell to take effect. 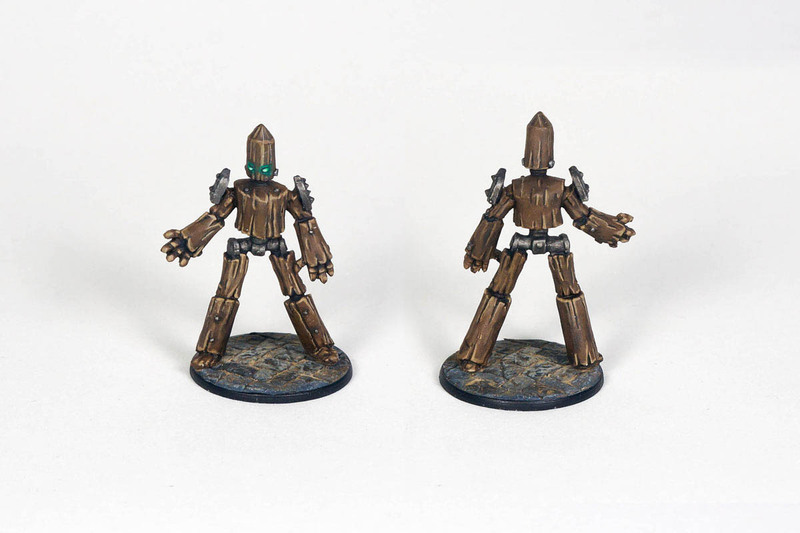 Your warband consists of your wizard (mandatory figure) and no more than 9 extra figures. These can be your wizard’s apprentice and 8 soldiers max. 10 figures in total, no more but it could be less. You have 500 gold crowns to hire your soldiers from a 15 type of soldiers pool (Thug, Thief, Knight, Ranger, Templar, etc). One of the schools of magic is the Enchanter, that has the ability to animate constructs (among other abilities, of course). Also, when you loot a treasure you spawn a random monster, which could be 3 types of constructs. 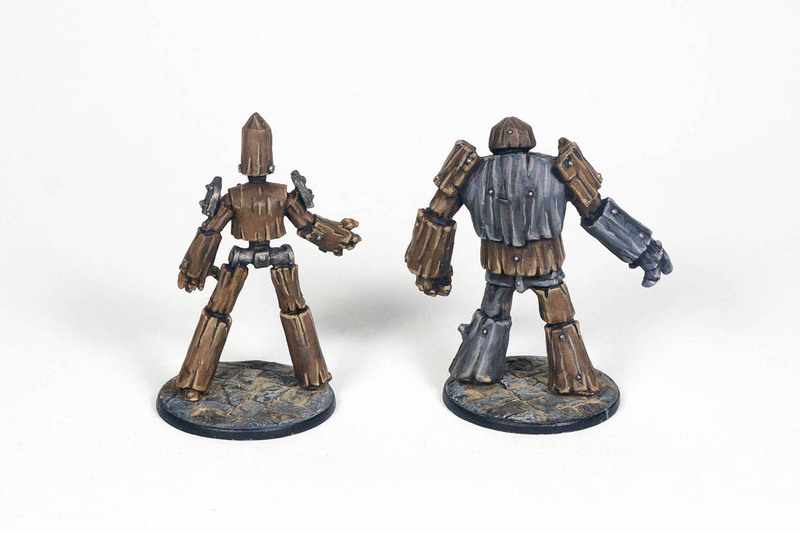 That’s why I’ve decided to paint two constructs for Frostgrave: the big and medium constructs. 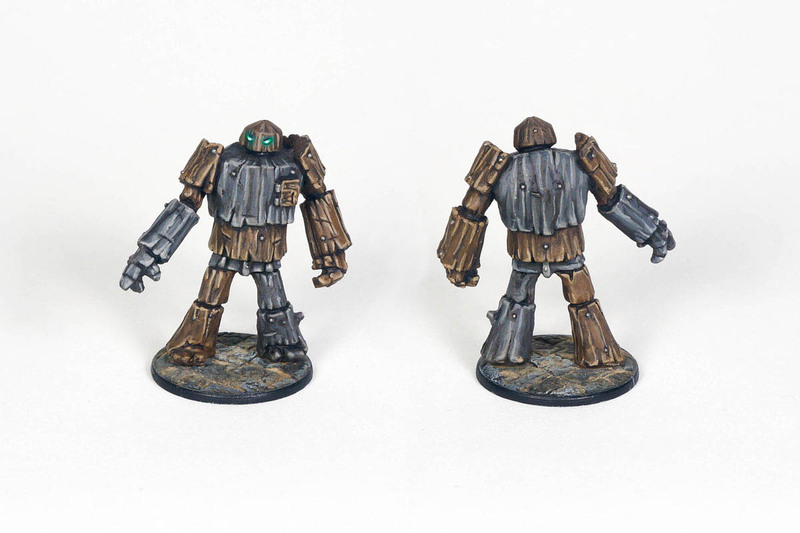 The minis are made of metal with a decent amount of detail that we cam improve with the paint. I decided to base all my warband with homemade cobblestone bases. I used Warlord’s new Bolt Action bases, which are thin with a little lip around. Great for my purpose. 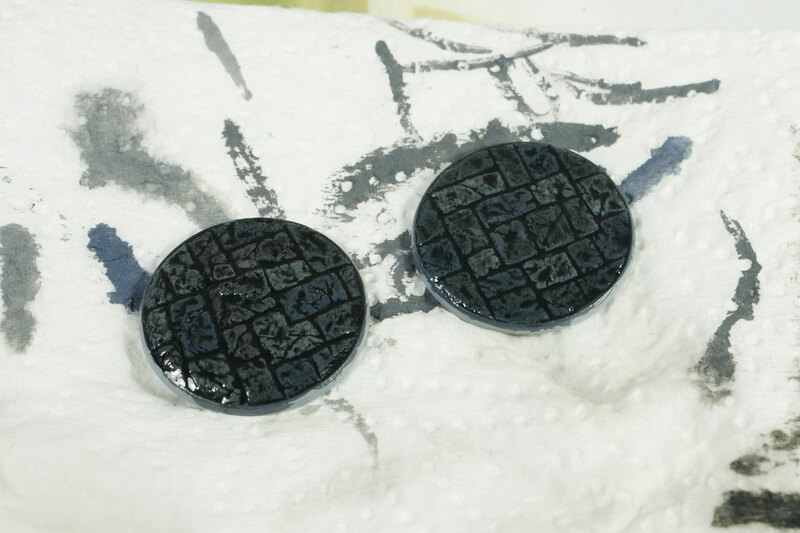 I sculpted the cobblestone with normal greenstuff, painted with 3 tones of grey and applied a very dark brown wash from AK Interactive. 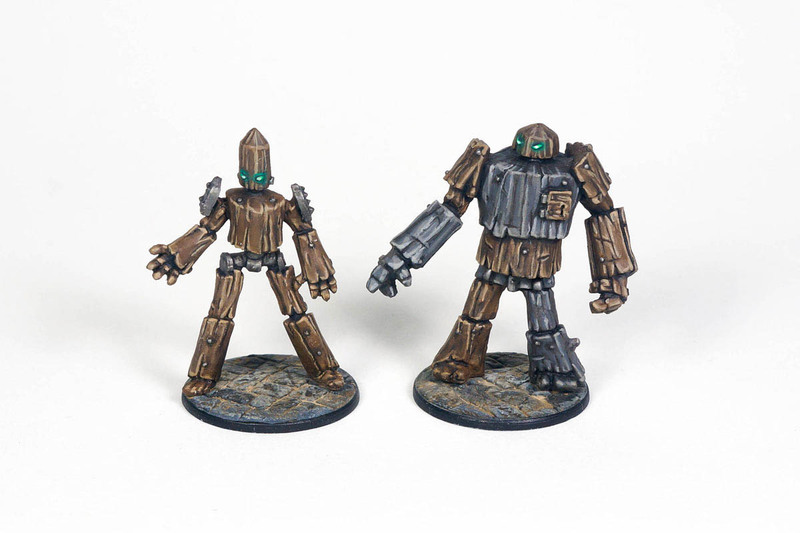 I painted the minis with Vallejo acrylic paints, guided by the original miniatures. No special effects added or something difficult. Just added some AK Interactive pigment to the bases. I’m thinking on putting some snow in the bases to all my Frotgrave minis, so they could better integrate with the frozen look of the scenery pieces. 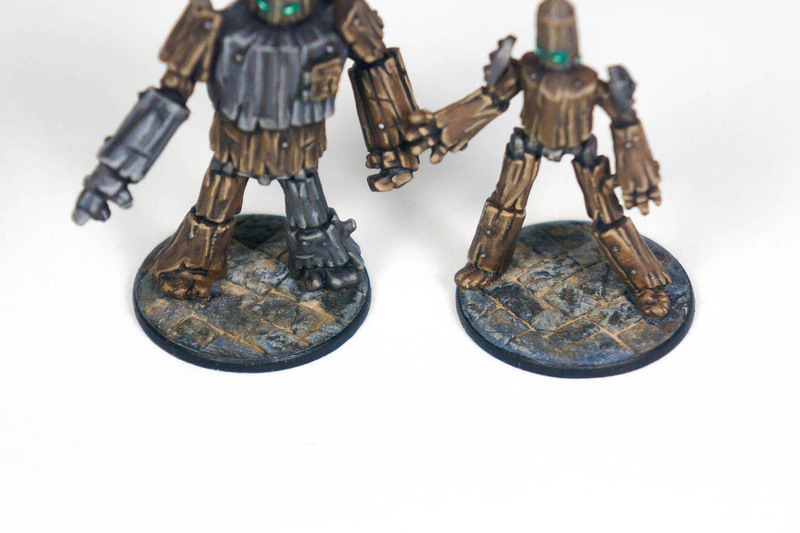 Here is a closeup of the cobblestone bases without snow. So, what do you think about it? With or without snow? I’d say snow, but be careful: got very nice results with GW snow… Until it dries and become awful. 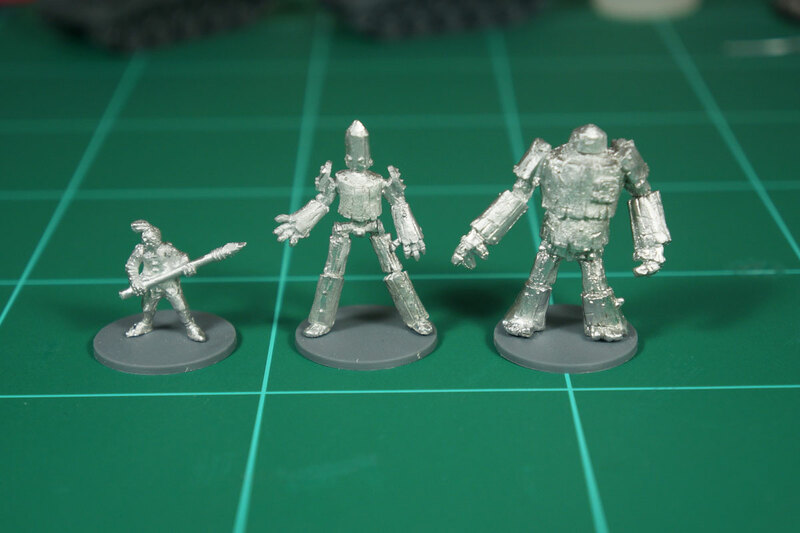 Some people says that baking soda is the way to go but mixing it with white paint as it will gets yellow with age… Better test on something before putin directly on your nice minis !